Do you remember that part in “My Big Fat Greek Wedding” where the kids are making fun of Tulla for eating moussaka? Well, I’m here to tell you that growing up in a Lebanese home and having a variety of ethnic food, I had moments just like that. 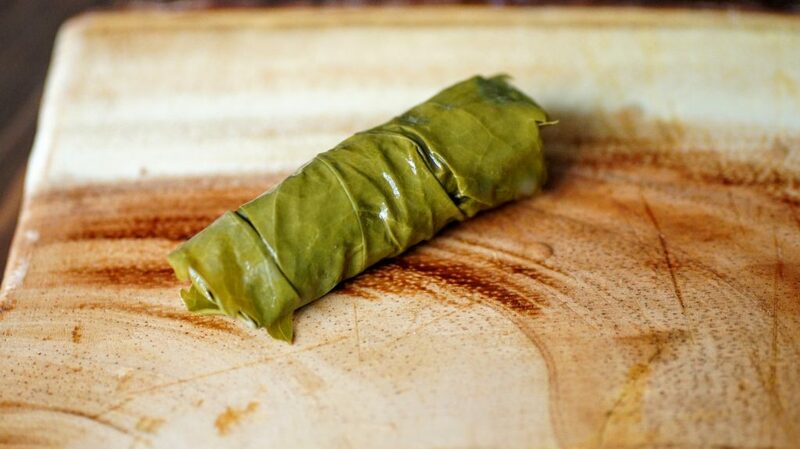 Rolled grape leaves, or dolmas are one of the most popular Lebanese dishes. I mean, we pick grape leaves off the vine (which most people compost) and decide to stuff them and eat them! Living in Portland, none of this seems strange now, but jump back 15-20 years ago or head to another city and this may not be so common. So…for those who are not familiar with stuffed grape leaves, they are a delicious and healthy Lebanese dish. 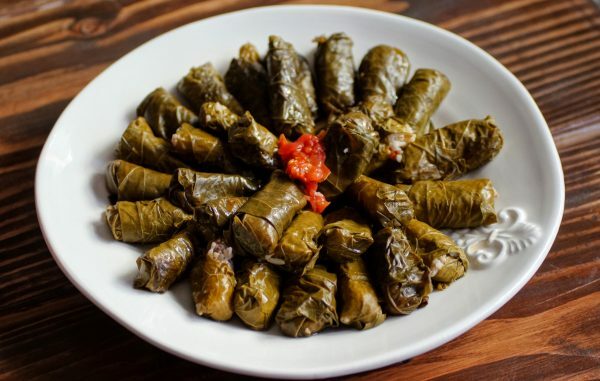 They are a common dish in the Mediterranean and have a variety of names: Dolmades in Greece, Dolmas in Turkey and Warat Areesh in Lebanon, which translates to grape leaves. Each country has their own variation of filling and technique but they are all delicious! My family’s version is vegetarian and even vegan, the leaves are stuffed with a lemony rice mixture. It is usually served as a mezze (or appetizer) dish. Living in the great Northwest, we are fortunate and have a perfect climate for growing grapes (ahem, that also means delicious wine). We planted our first grapevine a few years ago and have been enjoying not only the abundance of grapes each fall, but the luscious leaves each season. When I moved to the West Coast and began cooking, this was a MUST to learn from my mom. I used to help her roll these when I was growing up and my little kiddos are doing the same. I hope this recipe follows them through their life and into your own kitchen with your family. I’ve shared lots of pictures with you so you can watch the process of rolling and layering. I would love to see your creations! Tag me on Instagram @CosettesKitchen or post on my Facebook Page. 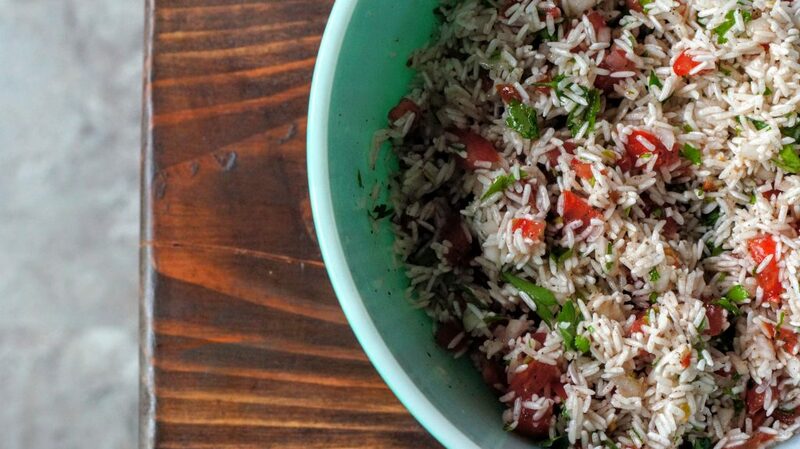 Grape leave mixture of rice, parsley, tomatoes and spices. Extra lemon gives these a nice tangy flavor. Ready to roll grape leaves. 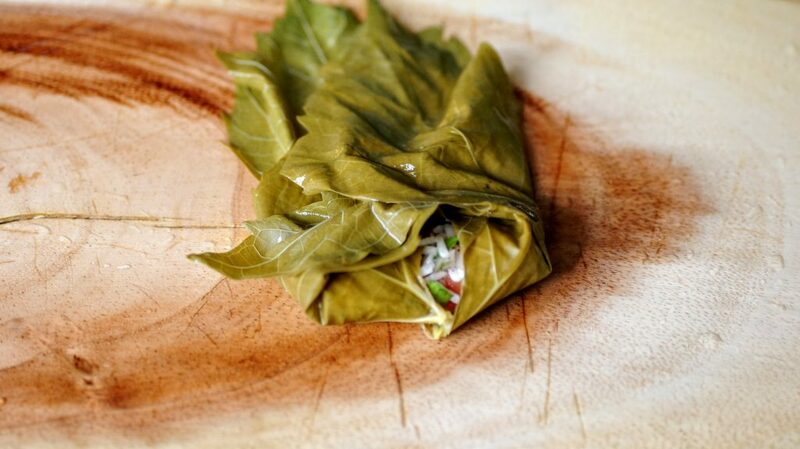 Each blanched leaf is laid flat to roll. Next, sides come in to close. 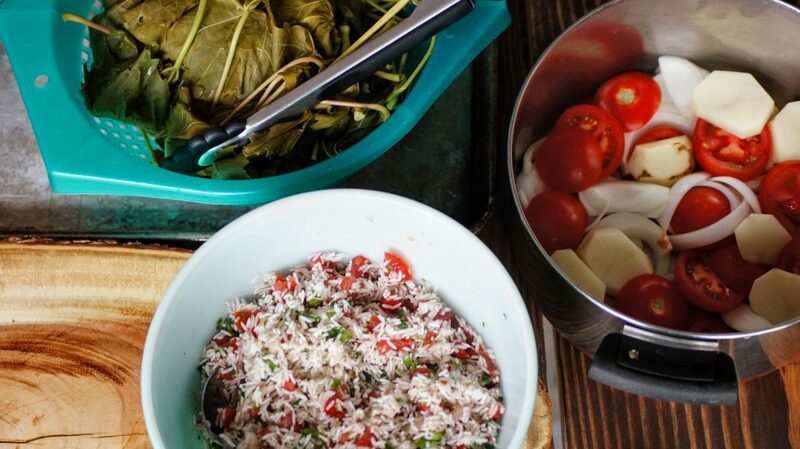 Layer your rolled leaves on top of your potato/tomato mixture. Place heatproof plate on top to keep rolled leaves from floating up. Remove after cooking and enjoy warm or room temperature. Rolled grape leaves or dolmas are a vegetarian and vegan Lebanese dish. 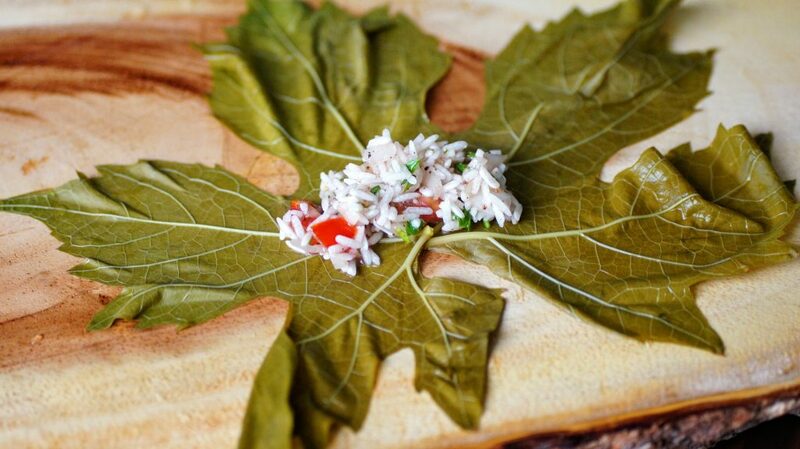 The stuffed grape leaves are made with a seasoned rice mixture. These are perfect to serve as an appetizer or on a charcuterie board. 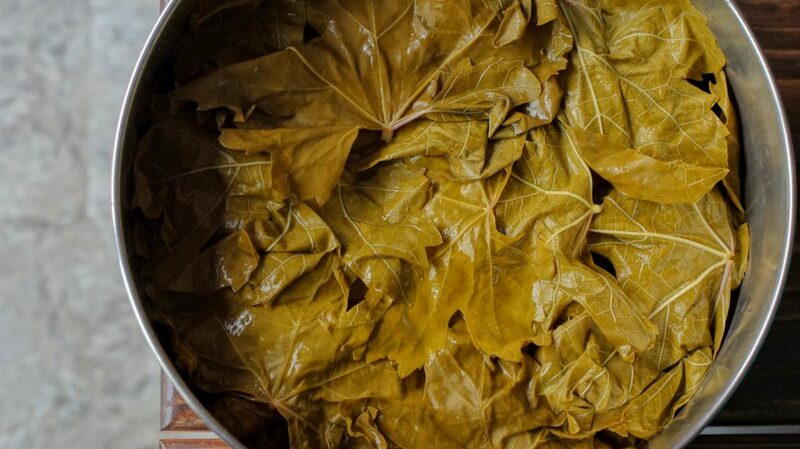 **See blanching instructions below for fresh leaves** If you do not have access to fresh grape leaves, you can find jarred leaves at your local Middle Eastern grocery store or in some specialty markets. 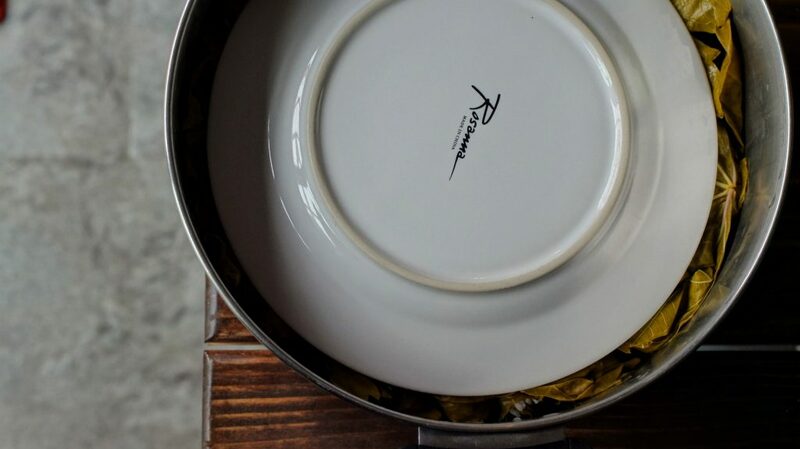 If using the jarred leaves, drain and rinse the leaves. Place in colander to drain and keep covered with a damp towel so they don’t dry out. The jarred leaves tend to dry out much quicker than fresh leaves. To make the filling: combine your rinsed rice, 1 medium onion chopped, 2 firm tomatoes chopped, chopped parsley, salt, pepper, all-spice, lemon juice. Mix until everything is incorporated. You can sample at this point to see if it’s salty and lemony enough. You want the salt/lemon flavor to be slightly stronger as this mixture will boil and lose some of the tartness/saltiness. 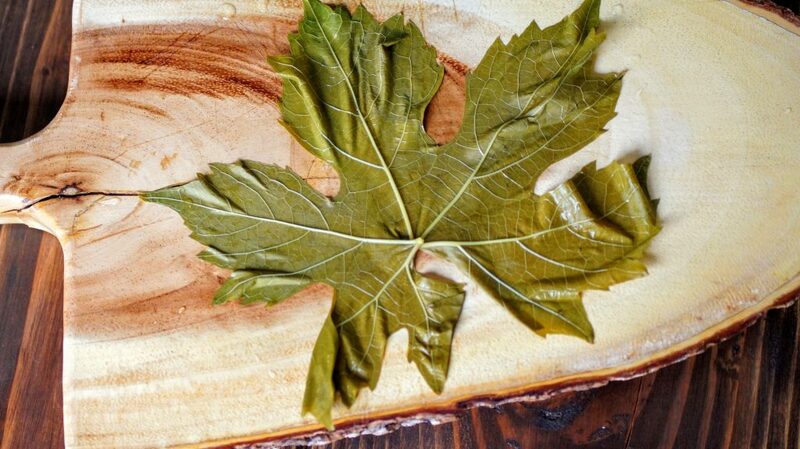 To stuff and roll the grape leaves: Remove one of your grape leaves and place face down, outer side of leaf facing down. Trim any stems that may still be attached. Fill one heaping teaspoon of your rice mixture into the center of the roll. Fold bottom flaps up then fold each side toward the center. Holding the mixture in place begin rolling, tuck any long edges of the grape leave in. Continue for all your leaves until your rice mixture is done. Line a heavy bottomed pot with your olive oil, 1 medium onion sliced, sliced potato, 1 sliced tomato. 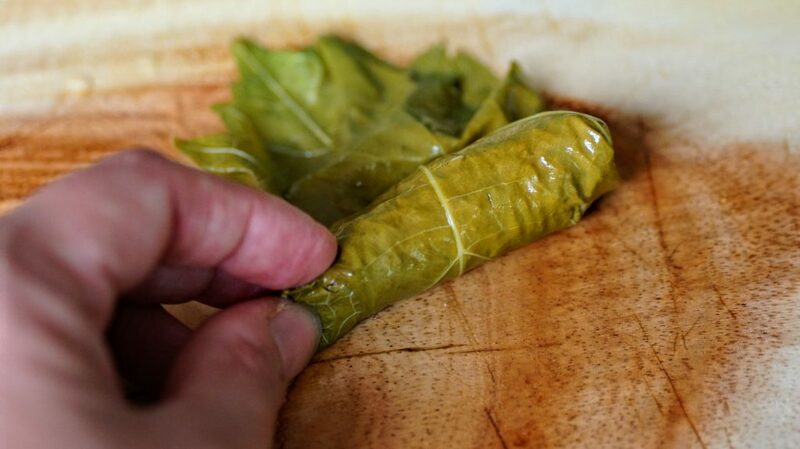 Begin layering your rolled grape leaves in the pot and continue for all your leaves. Sprinkle some kosher salt in between your layers. 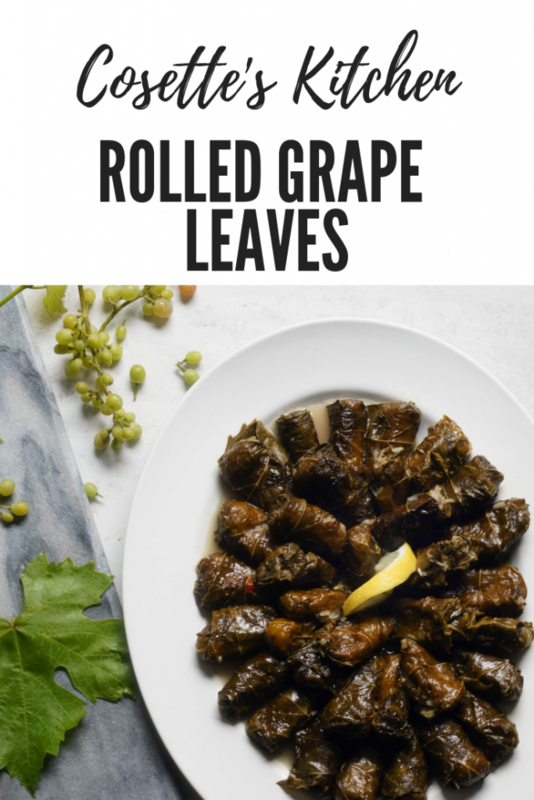 Lay several unrolled grape leaves on top of the rolled leaves. Place a plate on top to hold them down and prevent them from floating while cooking. Fill pot with water covering the the grape leaves and plate. Cook on high until it boils, then lower heat to low and let cook for 1 hour uncovered. If you are fortunate to have your own grapevine, you’re definitely going to want to pick your own. 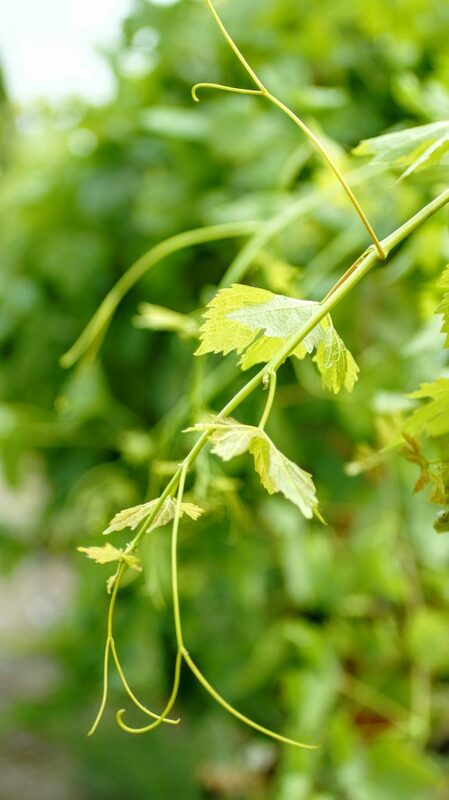 Choose medium sized leaves that are newer, toward the top of the vine. I am selective when I pick them and only choose the most tender leaves. Fill a large pot with water and bring to a boil. 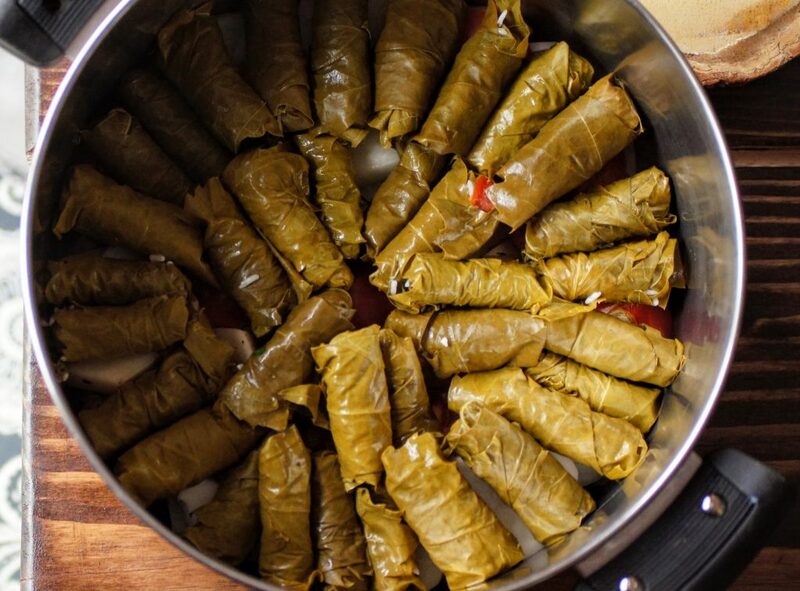 In several batches, add a bunch of your fresh picked grape leaves in the pot. Their color will change from bright green to a dull/army green. Remove with tongs and place in a colander to drain. It is very quick, maybe 10-15 seconds. 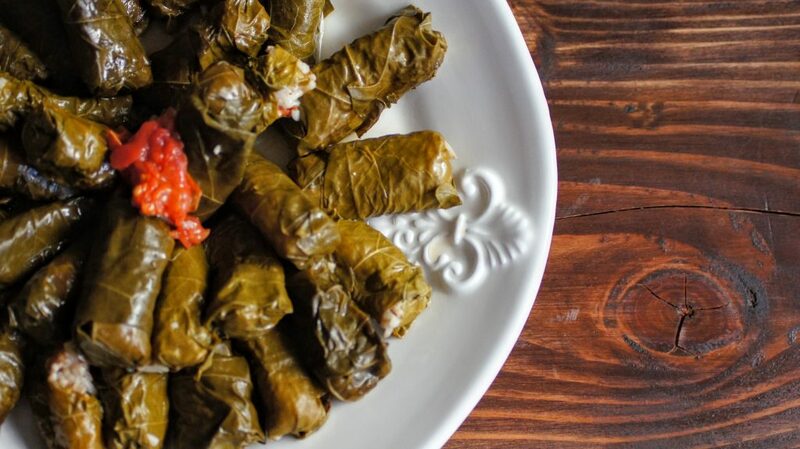 Grape leaves can be served warm, at room temperature or even cold. Serve as is or with pita bread. 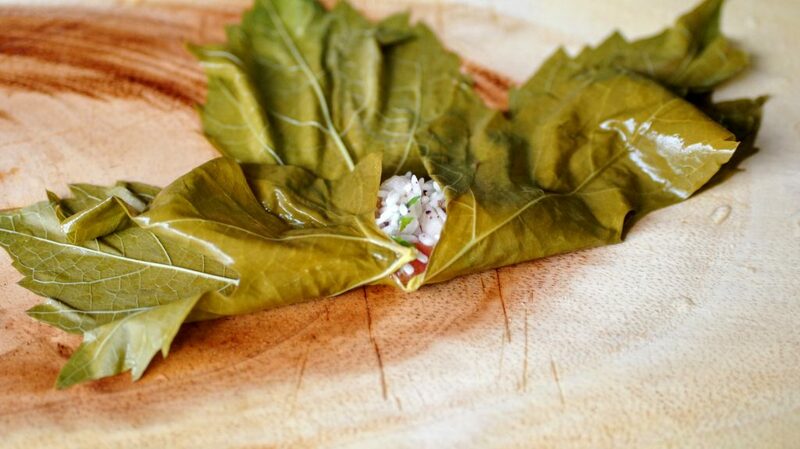 You may store fresh grape leaves in the freezer. I lay the unblanched grape leaves in foil and place in a ziplock bag. Place in freezer, let thaw when ready to use, blanch and continue as normal.